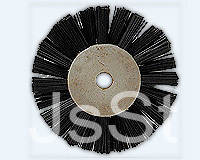 We are the manufacturers/exporter /suppliers of special custom brushes we can make for our client, we have industrial cleaning brushes in brass, stainless steel material with round, circular shape for various application. Special Brush by Jay Shaktima Textile at Pakbiz.com a premier Business to Business marketplace and largest online business directory. Find Special Brush from India complete basis & contact information, business offers, availability & related Textile Products products. This page gives you information about the authentic sellers of this product. It allows buyers and sellers communication directly. It can also facilitate the buyers to purchase the product in reasonable prices.